This article is a light-hearted and fun introduction to Essential Oils (EOs). If you are interested in improving your physical, mental, and emotional wellness or just love smelling beautiful then keep on reading! What are EOs? Well… EOs are extracted from plants through cold pressing or steam distillation. They are natural oils with biological healing properties as powerful as pharmaceuticals. For this reason, if used correctly they can have a profound positive impact on your overall health, but they can also be a waste of money and even cause great harm if used incorrectly. As you already know, if you read my previous posts, I am obsessed with fueling up my body with the right foods and thoughts, recently I added EOs to my long list of obsessions! In fact, nowadays, I don’t just carry avocados and sardines in my handbag but I dare not to leave my home without my favourite EOs. Like everything in life, quality is so much more than quantity. EOs are powerful and potent and for this reason, should be treated with love and responsibility. In fact, it takes roughly 50 roses to create just one single drop of EO, so being mindful when using them is very important. More often than not one drop at a time is more than enough. Trust me when I say that I experienced many mini-disasters when I first started using them in my life, hence this article to spare you the trouble. The biggest and most costly mistake I made was when I listened to the wrong advice and failed to do my own research. Instead of diluting the oil first in a carrier oil or a sweetener such as honey, I put 2 drops of EO straight into the water. Well… I learnt very quickly this was a mistake. The droplets of EO just ended up coating my glass. Fortunately, I didn’t experience any discomfort while drinking it, but I know a few people who had irritated their esophagus and even developed acid reflux through ingesting undiluted oils regularly. Plus, good quality EOs are far too expensive and require too many plants to waste them like this! Anyway, I am glad I learnt fast before causing any damage to my internal organs or my wallet. I start my morning by switching on my steam diffuser. I put a few drops of Frankincense and Lavender and this gets me ready for my morning yoga and meditation. After my shower I apply EOs to my skin, the choice of oil differs depending on which I feel the most attracted to on that specific day. However, Ylang Ylang (2 drops) is usually my favourite. I simply dilute the EO with 4 tablespoons of avocado oil or almond oil and apply it to my wet skin, massaging for a few seconds. Never use undiluted oil as it might irritate your skin. To smell nice without toxic concoctions (aka conventional perfumes that disrupt our endocrine system) I wear my essential oils. Our skin is our largest organ and whatever we put on it gets absorbed straight into our bloodstream, read my previous post on it. I apply a few drops of either SoftTalk, Geranium, Wild Orange or Balance Blend behind my ears, to my wrists and on my neck. My favourite for Autumn is Wild Orange and as soon as I sniff it, I have an instant smile on my face. There is something very uplifting in this oil. 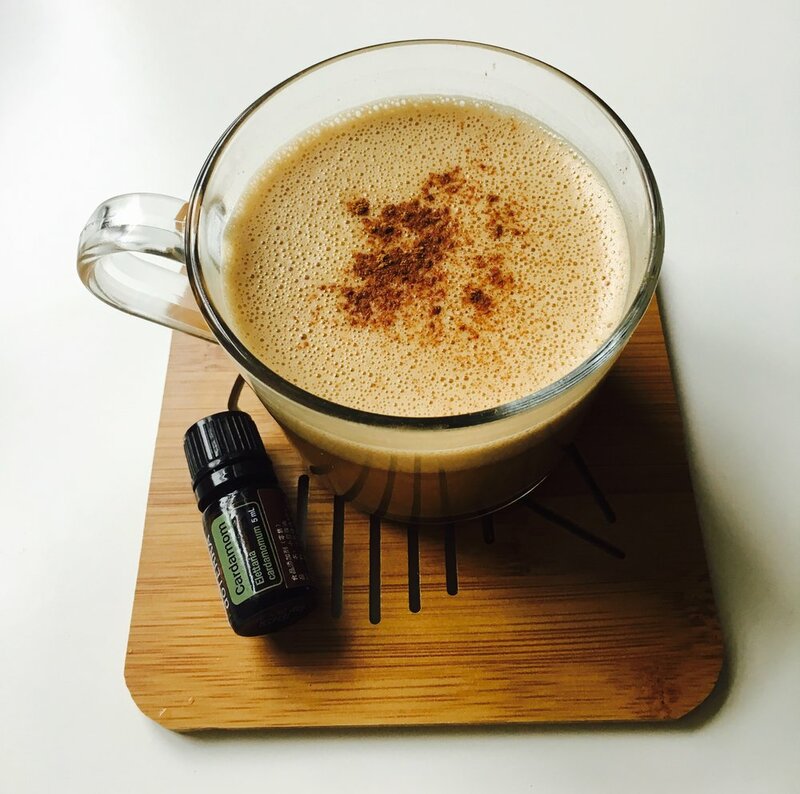 Instead of buying over the counter drugs I make a delicious drink with 2 drops of OnGuard Blend (wild orange, eucalyptus, rosemary, cinnamon, and clove), minced fresh ginger and raw honey….yumms. You need to first dilute the oil in the raw honey and then add it into your warm drink and mix it well. I also rub OnGuard on the bottom of my feet. And if you’re suffering from a sore throat, then mixing two drops of Lemon EO with coconut oil and rubbing it on your neck should help. InTune Blend helps me stay on task when I create articles or do anything study or work related. This blend comes in a glass roll-on bottle which makes for an easy application. If I need an extra lift, especially on a rainy day, I just put a few drops of Wild Orange on my wrist to boost my mood and then defuse some Peppermint and inhale it. This totally shakes off any fatigue. Oregano oil is great for fighting fungal or parasitic infections. I use it when travelling to exotic places. If my stomach doesn’t feel well I mix one drop of Oregano with 1 teaspoon of coconut oil, then I put the mixture into a gelatin capsule to make sure it gets all the way into my stomach. Please never take this oil internally without diluting it as it can burn your mouth and irritate the esophagus. For stomach ache, I use Peppermint EO, but remember one drop of this oil is equal to 28 cups of peppermint tea! So use it wisely. When I travel for work, which is very often, I use Balance Blend to calm me down, especially when travelling by plane. I simply open the bottle and inhale it deeply (ahhh… ) and rub it on my wrists, and behind my ears. Lavender is my go-to oil for a peaceful sleep. I diffuse lavender and rub some on the bottom of my feet 30 minutes before bed. For sunburn, bruises, or scars I use Lavender diluted with coconut oil. I make my own All-Purpose EO cleaner, I add 5 drops of Melaleuca (Tea Tree) and 5 drops of Lemon to 1 cup of white vinegar and 2 cups of water and then mix it well. Shanghai can be humid thus prone to threats like fungus, mold, viruses, and bacteria so I find it especially useful for the bathroom. Being crazy about cooking and baking, my favourite way to use EOs is in the kitchen. All you need is about 2 or 5 drops to experience the amazing flavours of EOs. Lemon, for example, is great when steaming or baking a fish. Just add 2 drops of Lemon EO to your extra virgin olive oil marinate for a beautiful flavour. OK, now onto the NEW recipe! In a bowl combine almond flour, coconut flour, salt, and baking soda. Pour in coconut oil (dissolve the EO in the coconut oil first), eggs, honey, coconut milk and mix well. You can do this by hand or use a high-powered blender. Notes: Optionally you can make some primal frosting from coconut butter. Brew your favourite organic black tea or coffee. In a saucepan heat coconut milk over medium heat, switch it off and add EOs and honey. Mix Well with tea or coffee and enjoy! If you’re ready to get your hands on some doTERRA EOs, then grab one of their starter kits (http://doterra.cn/first-order.html ) and sign up with my Sponsor ID, 237125, to get doTERRA products at wholesale prices (35-40% below retail). DoTERRA Kits are amazing as they include free oils and your enrollment fee is included in the price. Once you try doTERRA EOs I’m sure you’ll love them as much as I do! 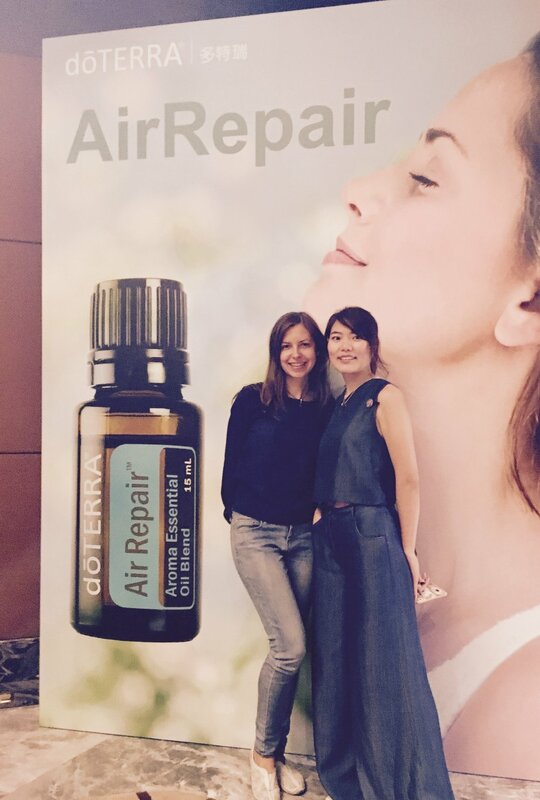 If you’ve any questions regarding doTERRA EOs reach out to me at thriveinshanghai@gmail.com or leave a comment below. BOTTOM LINE: LESS IS MORE IN THE WORLD OF ESSENTIAL OILS, THESE ARE POWERFUL MEDICINES AND SHOULD BE TREATED AS SUCH. I hope you’re having an epic October Hols! Aromatherapy for health care: an overview of systematic reviews. A systematic review of the effect of inhaled essential oils on sleep. Effectiveness of hand-cleansing formulations containing tea tree oil assessed ex vivo on human skin and in vivo with volunteers using European standard EN 1499. The effect of aromatherapy abdominal massage on alleviating menstrual pain in nursing students: a prospective randomized cross-over study. Newer PostHAPPINESS - What's all the fuss about?